This is another of my 'It's really not that important, but it would be interesting to know' questions. I like to keep my refrigerator set as low as possible without anything freezing. While adjusting the temperature for that setting, my eggs always freeze. I don't understand. I keep my eggs in the carton. They are on a shelf usually right beside the milk. Why will my eggs freeze at a temperature not low enough for other things to freeze? Now, I keep my eggs in a vegetable bin at the bottom of the fridge. Not as convenient, but they don't freeze. There may be something wrong with the thermostat in your refrigerator. Get a thermometer and see what the temperature really is. I never understood why this happens then I saw this article that talks about problem areas in fridges. Mine is in a back, left corner, so I just learned not to put anything there. Be sure to troubleshoot the temp as Judy said. If all checks out, it may just be avoid the spot. Go figure! But when I kept the eggs not one inch away from the milk, the eggs froze but the milk didn't. There couldn't have been a degree difference in the temperature of the two places. If I put two glasses of water side by side in the refrigerator, take one tablespoon of water out of one glass and replace it with one tablespoon of vodka, the water without the vodka would freeze first. I think it has something to do with what the eggs are made of. Or maybe the butter fat in the milk keeps it from freezing at a temperature that freezes eggs. If you kept your eggs in a container as airtight and thick as the milk, they would not freeze, surely. I think it's because air gets through to the eggs because of their more flimsy packaging. There are two spots in my fridge that I've learned my eggs freeze: in the back and in the middle front. It's all about the circulation shift. Find the place where they don't get as cold, or switch their containers out. 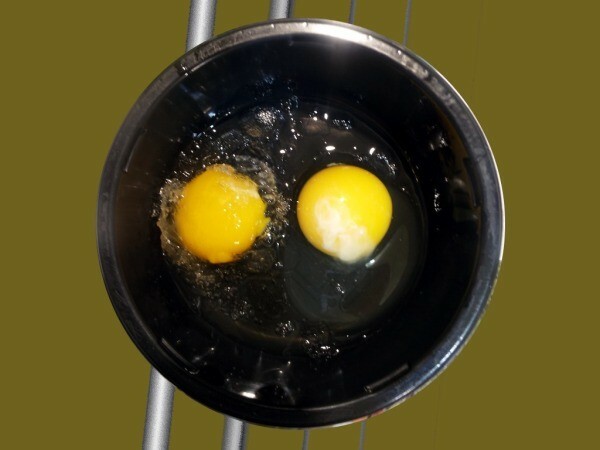 I immediately thought of you when I cracked these two eggs into the bowl. They were the last two in the carton and they were side by side. One is frozen, the other is not. Go figure. there's something about the shape and size of eggs that just invites freezing and being more prone to problem areas.